This mini-tutorial describes a simple technique for making a “punch-in” to make a correction to a part of a recording., useful when you make a short fluff or cough. Good Practice Tip: Always make a backup copy of a recording by exporting it as WAV or FLAC, immediately after you stop the recording, before you work on the punch-in. To “punch-in” a correction to a recorded track, we use a new track for each take. This allows us to hear a “lead in” and “lead out” (pre-roll / post roll) and, if necessary, to make multiple attempts at correcting, from which we can select and use the one that we like best. The first thing to do is to make a backup copy of the track, so that if you mess up, you have something to go back to. In this illustration the track has been duplicated, using the Ctrl + D shortcut, and muted using the Mute button. The backup copy is muted so that it won’t play. You may find it useful to collapse this track to save screen space by clicking the Track Collapse button . In the example the part to be changed is marked with a label, which is not really necessary, but is for illustration purposes. The “bad part” has been silenced. The easiest way to do this is to select the bad part, then use the Ctrl + L shortcut. 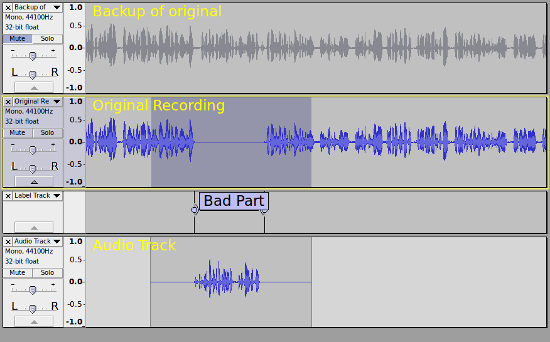 But only do this in the working copy of the track – be careful not to edit the muted backup copy. Ensure that you have Audacity set for overdubbing in the Recording Preferences (this is the default setting). Also ensure there that “Software Playthrough” is turned off (default setting). And now you are ready to record the “drop in” (punch-in). You will need to record on a new track, so just hold down the Shift button and the Record button will change to the alternate Record New Track button. Now click that Record New Track button (or use the Shift + R shortcut) and Audacity will start recording on a new track, and will stop automatically when it reaches the end of the selection. Now is the time to listen to the punch-in repair you have made. Select around your punch-in repair (leaving the backup track muted) and press the play button. If you are happy with the repair you can delete the backup track from the project.